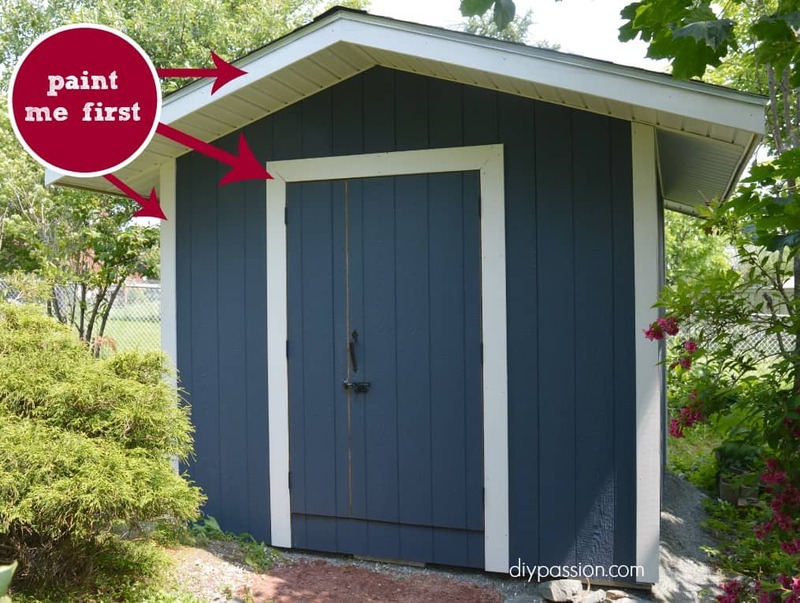 Thinking about how to paint your shed? There’s a right way to do it, and it’s not difficult. It means picking the right paint, the right supplies, and using the right technique. Simple! Now I’d never painted a shed before, so while Erin was away for a week visiting family, I decided I’d learn how to do it right. And over the course of the three days in July, I figured it out. Before we get to this, you might want to bookmark these other how-to paint posts. We do a lot of specialty items and have some great paint tips. You might recall last fall we told you the story of Vlad the Russian superstar builder. Vlad built us a shed for the ages. It’s been a godsend. We’ve quickly stuffed it full of lumber, garden tools and other odds and sods. But after enduring particularly horrible Canadian winter, we knew that we needed to paint it. Ours was built with siding known as “smart panels,” which are designed to resist rot, but aren’t much to look at. Still, painting the shed not only helps it look a lot spiffier, it serves to protect from wear and tear. Anyway, up ’til now, Mr. Shed’s been looking real sad. Pale, greyish-beige. Blech. We needed to get paint on those panels, and on the wood trim. So, I took an hour to scrub the dirt of the siding, swept away some cobwebs and bugs from corners, and then got to work! There are two considerations – picking a great colour and the right kind of paint. The kind is the easy part – choose a good exterior paint that promises 1) to be mildew resistant, 2) to be fade resistant, 3) to be durable, and 4) cover easily. 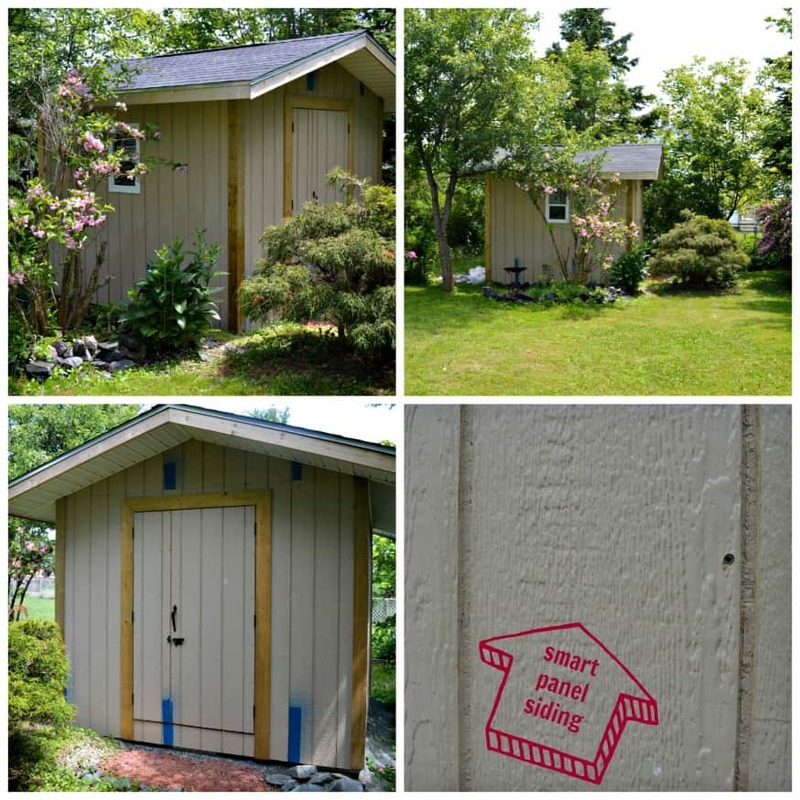 – For the siding, we chose a “paint & primer” acrylic latex product from Para Paints*. The smart panels were pre-primed, so this may have been overkill, but we figured the primer add-in could only help with coverage. – For the wood trim, we chose an exterior stain that was an oil & latex hybrid specifically designed for projects like decks, fences and sheds, again from Para Paints. In terms of colour, choose something that both accents your yard, and complements your surroundings. We have a lush yard that gets a lot of direct sun. There are several mature trees, and plenty of lush shrubs and bushes. Think: assorted shades of green, and flowering pink and white blossoms. We opted for a slate blue called “Mid Town Sky Scrapers.” It is a nice pop of colour in our yard, but that brings to mind our Atlantic Canadian surroundings – ocean blues & shoreline greys. 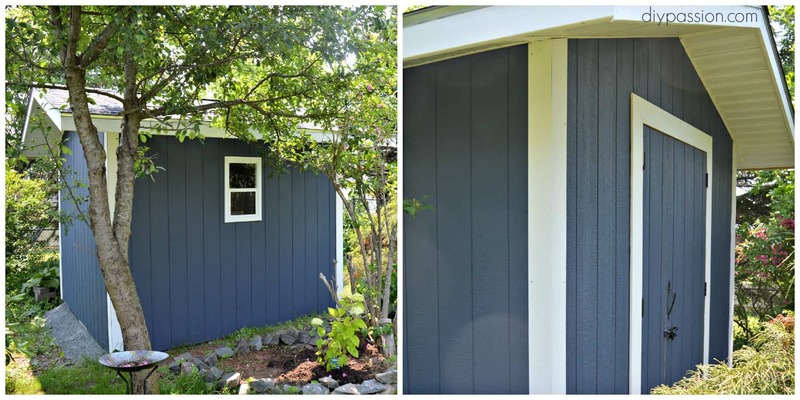 For trim, we chose a crisp, clean shade called “Pioneer White” that looks great against the blue. I suppose you could do it all with one brush and a step stool, but some supplies can definitely make it easier. The roller really was key. This sucker sopped up the paint and rolled it on beautifully, like icing on a cake. It was immensely satisfying! The 4″ brush was another coup. It was great for when I needed to apply thick, long brush-strokes. The smart panel seams would not cover with just the roller, but this brush made quick work of them. Ok, so I’m not going to spend a lot of time on this one. If you’ve painted before, you’ve a pretty good sense of what works, and what doesn’t. But with an exterior projects, it’s worth remembering a few things. Mornings and evenings are better than afternoons. Afternoons (especially in July) can be hot. Painting in the heat is no fun. You’ll get frustrated, and start rushing. No good. Take your time. Again, don’t rush it. Painting can be meditative – I swear! There’s something calming about careful, deliberate work, where your surface is gradually coated in a lovely new shade of colour. Also, for the more delicate steps, like edging, you can take your time and paint accurately, without the need for all the sticky, green painters tape. Paint the trim first, then the walls. I did the opposite. It would have been easier in retrospect, to paint the trim white first, and then go back with the blue later. Why? As I was painting the upper trim, my paint dripped down and blemished the wall! Which meant touch ups.. Nothing crazy, but it would have saved me a bit of time to have painted the trim first. I find it easier to paint walls without messing up the trim, than painting trim without messing up the walls. Leave the dog inside. I invited the dog to keep me company. He got blue paint all over himself. Blue doggy means bathtime for doggy. That’s it! All told, I spent three mornings, and two evenings on the shed. And we’re really happy with the results! This post contains affiliate links for your convenience. See our disclosure policy here. *We are members of the 2015 PARA Paints Blog Crew. We get paint from them to do our projects, but our opinions are completely our own. This looks so great! 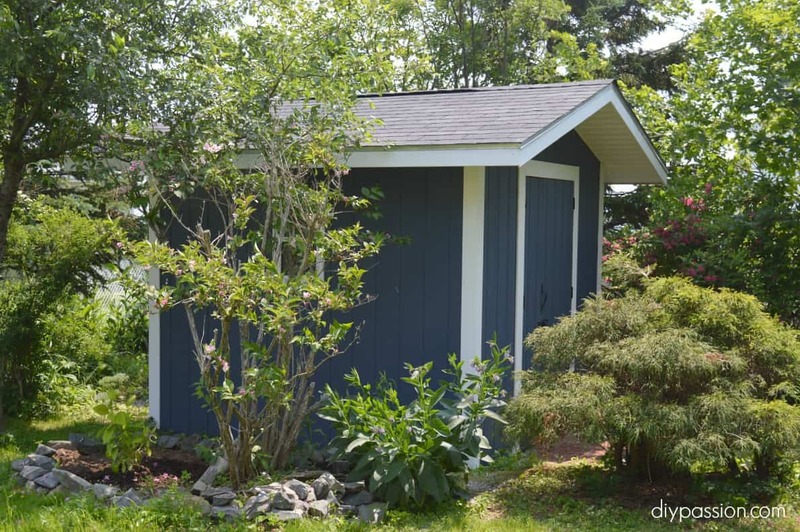 Love that blue – perfect choice for a shed. And this Vlad character sounds like a very interesting man and I sure could use him to come build me a shed! hah!